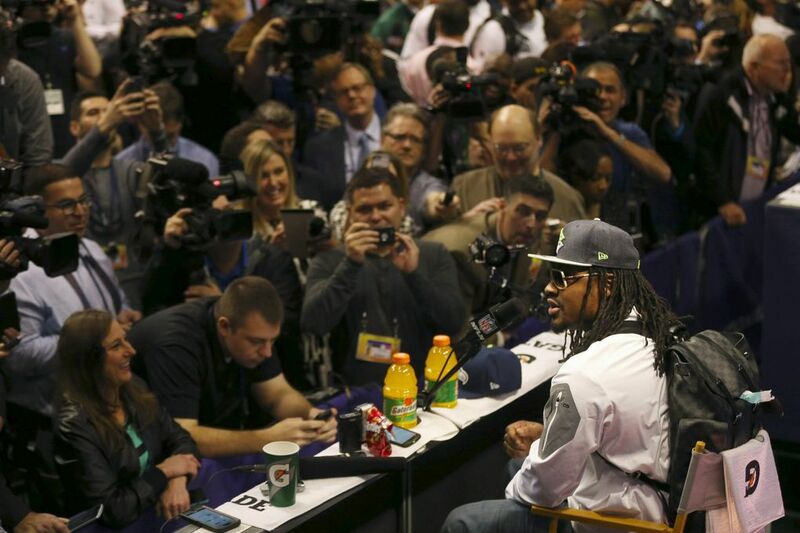 Marshawn Lynch is now looking to trademark "I'm just here so I won't get fined." Marshawn Lynch isn’t going to let this opportunity get thrown away. Lynch captured the nation’s attention during Super Bowl week by repeatedly answering media questions with variations of the comment “I’m just here so I won’t get fined.” Well, now he’s filed a formal trademark application to own that sentence. The Seahawks running back has a growing stable of pending and approved trademarks, mostly related to his “Beast Mode” product line that he wants retailers to sell around the country. He first filed to trademark the “Beast Mode” term at the end of his rookie season in 2008. In his latest trademark application, which he signed last week, Lynch seeks to control apparel sold with the words “I’m just here so I won’t get fined.” That includes shirts, hats, beanies, hooded sweatshirts and more, according to the document filed with the U.S. Patent and Trademark Office. This isn’t the first time Lynch has turned a Super Bowl remark into a trademark. Last year, he summarized his reluctance to do interviews by saying, “I’m just about that action, boss.” He later applied to trademark “About That Action Boss” and is selling apparel with that phrase on his website. The Seattle Times reported before the Super Bowl about the Seahawks organization and its efforts to control trademarks around the number 12, the word “boom” and the phrase “Go Hawks.” In the process, the team has battled fans, local businesses and a former player.